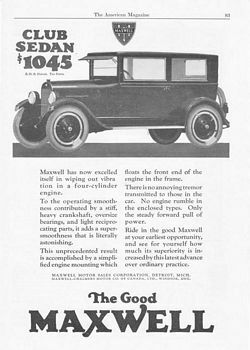 Classic Ads - Old Car Ads Maxwell - classic Maxwell car ads. 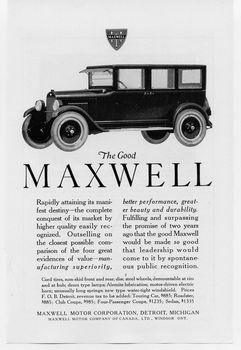 The Maxwell was a brand of automobiles manufactured in the United States of America from about 1904 to 1925. The brand name of motor cars was started as the Maxwell-Briscoe Company of Tarrytown, New York. The company was named after founders Jonathan Dixon Maxwell, who earlier had worked for Oldsmobile, and the Briscoe Brothers Metalworks. Benjamin Briscoe, an automobile industry pioneer, was president of the company at its height. Maxwell was the only profitable company of the combine named United States Motor Company formed in 1910. 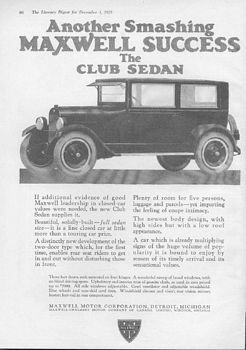 Due to a conflict between two of its backers, the United States Motor Company failed in 1913. Maxwell was the only surviving member of the combine. 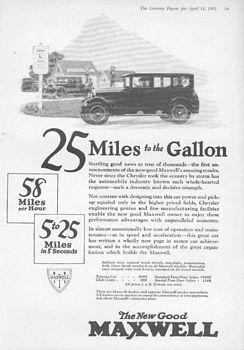 In 1913, the Maxwell assets were purchased by Walter Flanders, who reorganized the company as the Maxwell Motor Company, Inc.. The company moved to Detroit, Michigan. Some of the Maxwells were also manufactured at a plant in Dayton, Ohio. 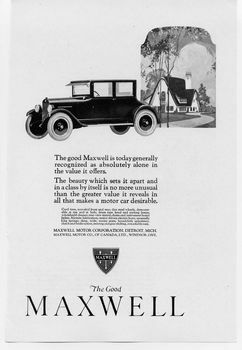 For a time, Maxwell was considered one of the three top automobile firms in America (though the phrase the Big Three was not used) along with Buick and of course Ford Motor Company. In a short period of time, however, Maxwell over-extended and wound up deeply in debt with over half of their production unsold in the post World War I recession in 1920. 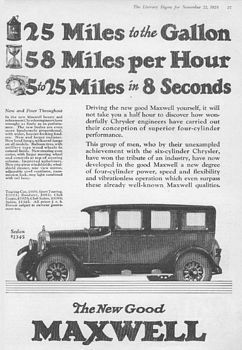 The following year, Walter P. Chrysler arranged to take a controlling interest in Maxwell. 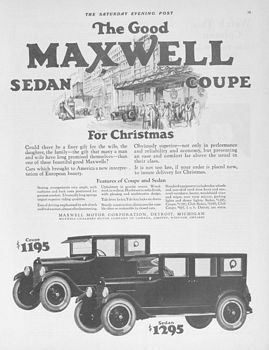 Maxwell Motors was re-incorporated in West Virginia with Walter Chrysler as the chairman. Around the same time that all of this was happening, Maxwell was also in the process of merging, awkwardly at best, with the ailing Chalmers automobile company. Chalmers production would end in late 1923. In 1925 Walter Chrysler formed the Chrysler Motors Corporation. That same year the Maxwell line was phased out and the Maxwell company assets were absorbed by Chrysler. 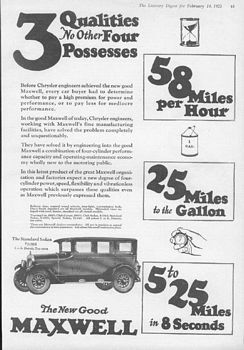 The Maxwell would continue to live on in another form however, because the new line of 4-cylinder Chryslers which were then introduced for the 1926 model year were created largely by using the design of earlier Maxwells. And these former Maxwells would undergo yet another transformation in 1928, when a second reworking and renaming would bring about the creation of the first Plymouth.